You may have noticed the poll I’ve had placed on the sidebar of Duncans TV over the last few weeks. We’ve finally pushed over 500 respondents. 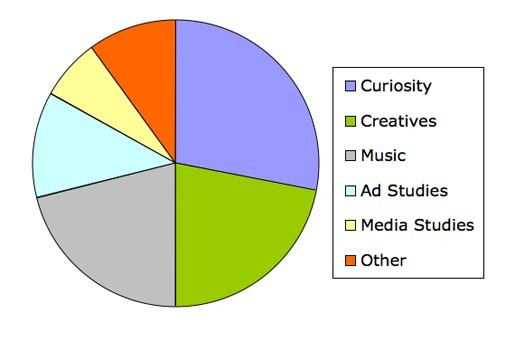 Here’s the results, from 503 responses to the question, “What is your interest in TV ads?”. I gave readers a choice of curiosity, work in the creative field, interest in music, student of advertising, media studies, or other. What is your interest in TV ads? So, does that show us anything? Statistically not a lot, considering that this site has been visited by an average of 1500 people a day. However it is clear that television commercials are of interest as a form to people outside the advertising world. To get someone to search for an advertisement on the internet means that something has worked. For some, it’s a matter of looking for trivia. Who made it? Where was it made? Who was in it? What did it mean? The ads that have generated the most interest would be the Ford Sportka ad, the Carlton Draught Big Ad, the ‘Where the Bloody Hell Are You’ ad, and the Nissan Tiida ads with Kim Cattrall. As soon as someone decides that an ad should be banned, everyone wants to see it! For others there’s the question of the music. The Nike Joga Bonito campaign, the Sony Bravia Balls ad, the Sprite Basketball ad and the Honda Impossible Dream still have viewers hooked through the music as much as the action. I started this blog partly out of admiration for the people behind the scenes. You see, I’m one of those moviegoers who stays right to the end of the credits. Partly to see if there’s bonus clip at the end, but partly because I see film as a work of art developed in conversation with the world. A blog is a place where that conversation can happen – where directors, producers, creatives, editors, composers etc can get some feedback in response to their work. Thank you to the professionals who have responded to my emails and phone calls, giving us a glimpse of the people and ideas behind the ads. The beauty of an online presence for television advertisements is that those preparing for a career in the field can learn from the best, and the not-so-great. To buy a CD or DVD of high-quality television advertisements can cost hundreds of dollars, usually beyond the budget of students. I believe that television advertising, along with its online presence, is an incredible source for those studying media and culture. I also believe there’s something to be said for exploring the values, spirituality, hurts and hopes of the world as expressed in these short films. Sure… carpet sales generally don’t qualify for this category. But I say it’s about time we had some decent carpet sale ads – ones that combine exotic mystery with the urgency of ‘must sell this weekend’. I’m sorry if any of these categories didn’t work for you. Why don’t you leave a comment to describe your interest in television advertising?